Well, after reading a very heavy book on the Vietnam War I decided that I needed something lighter, a lot lighter, to read so that my brain simply did not fry, so I grabbed the Asterix Omnibus from under my bed (I am progressively collecting them and reading these albums again because that are one of those books that I simply loved as a child and as a adult I still gain immense amounts of pleasure from reading them) and read this one (there are two more to go in this omnibus). This story is set entirely in the village, and I believe that the authors came to a point where they would publish one story where Asterix and Obelix would go on some wild adventure to some exotic land, and alternate them with an adventure set entirely in the village. Up until this story, with the exception of the first one, most of the stories have had Asterix and Obelix out travelling, so it is rather pleasant to see an adventure sent within the village, and the authors did give themselves a lot of scope to write a number of such adventures. As is normal for a day on the edge of the Roman Empire, the Romans are trying to concoct a way to defeat this village of Gauls who use a magic potion to keep the entire army a bay. The current plan is to use an ancient Gaulish tradition where if a village wants to conquer another village they agree to have a fight between the two chiefs. Now this village is pretty much the envy of all the other villages in that they are independent of Rome, however the advisor (who is always a shifty character in the Asterix albums) knows of a village where the chief is very pro-Roman. So, they ask him to challenge Vitalstatistix to a fight, and the promise that they will deal with the druid so that he doesn't have to worry about the potion. 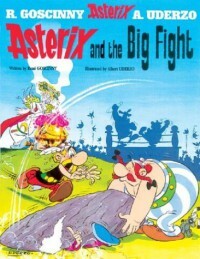 However, Obelix solves the Romans' problem for them by accidentally throwing a menhir at a group of Romans and misses, sconning poor Getafix instead. Unfortunately all of Getafix's senses are knocked out of him and he pretty much forgets everything, including how to make the potion. So, Vitalstatistix, who cannot turn down the fight, must work out a way of defeating his opponent without the use of the potion (and in fact, he actually does manage to do that, but I won't tell you how because that will simply spoil the story). In the meantime, Asterix is trying to find a way to restore Getafix's health, first of all by getting him to randomly make potions (with rather amusing results) and then hunting for a psychiatrist to help (yes, they did have psychiatrists back in those days, or so the Asterix ablums tell me, and they are based on historical fact, aren't they). Anyway, very amusing story, and while I won't say that it had me in stitches, it still brought a smile to my face, and proved to be a wonderful follow up to a book that I had found very deep and confronting.